Sometimes it is the smallest things that draw me to a picture book, sometimes it is the title, other times it’s the illustration on the cover. This time it was a bit of both, the disgruntled mouse on the cover in his knitted jumper was all it took, coupled with the title and I picked it up. The story is what it is, there is a bear on the mouse’s chair. 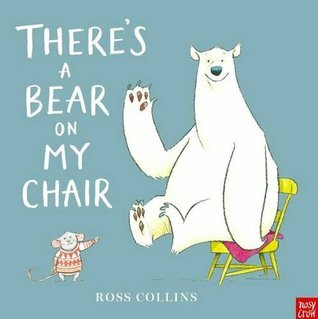 In clever rhyme, Collins explains the many ways the mouse has tried to remove the bear from his chair. There is a style of Dahl and a touch of Seuss in the rhymes which are fun and create a great flow as you read, coupled with great visual text to help with emphasis on certain words and highlight the mouse’s frustrations. One of the joys of reading picture books are the accompanying illustrations. The simplest expression on a character can be the highlight for me and this is no exception. The irritated mouse and the obliviously happy bear make you joyful even before you read any of the words. The story is fun and the rhyming gives it great rhythm as you read. There was no explanation about why there was a bear on the chair, and it doesn’t really matter it’s an enjoyable read with light humour. The biggest mystery of all though, is why this mouse had a chair that was big enough to fit a bear on it in the first place. If he had done his shopping better he wouldn’t have this problem at all for the bear would not fit on his tiny mouse chair.